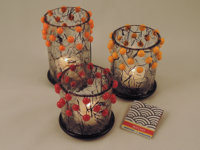 Watch this video in which two different Round Votives are created. 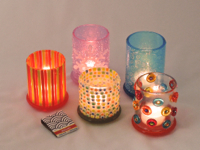 Make sure to download the Round Votive project sheet, too. These molds fit into small, tabletop kilns. 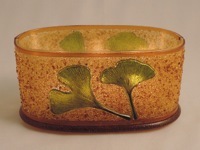 The wonderful results and easy-to-follow instructions make this mold perfect for both beginners and experience artists. 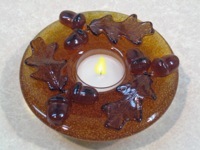 Oval Votives are easy to make and perfect for gifts. 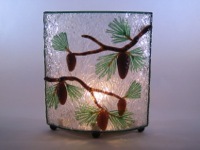 The Oval Votive’s larger surface provides the artist with ample room to compose their own design. 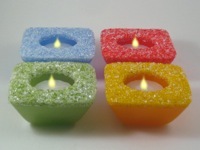 Medium mesh frit is "sugar fired" to the tops of our 3" Square Candle Holders. It is a simple technique with impressive results. 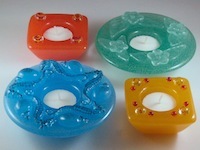 Colour de Verre’s cast candle holders are easy to make and – plain or fancy – are always a welcome gift. Two of these acorn and oak leave embellished candle holders on the mantle or three running down a dining table is a great way to welcome autumn. 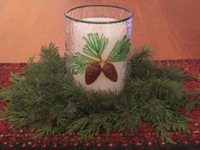 This makes a superb centerpiece for a holiday table or festive, winter mantle accent. 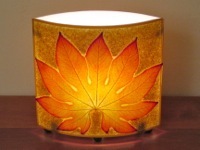 The warm light this lamp emits is a welcome addition to almost any living space. 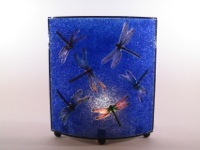 Colour de Verre’s lighting formers and hardware are a great way to show off your artwork. This document lists some tips for getting the best results. Streamer glass is accented and framed with black glass “noodles” to create a look that is reminiscent of Japanese rice paper screens. Beautiful results. Just requires two firings. Create a beautiful accent lamp using Colour de Verre’s new lighting components. 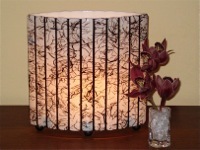 The lamp makes a perfect addition to your - or a friend’s - bedroom, living room, or mantel. Create a beautiful accent lamp based on Colour de Verre’s 5” Diameter Round Hardware and Panel Former. 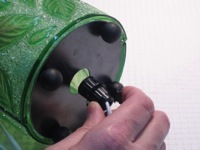 The instructions can be easily modified to create a lamp to perfectly suit almost anybody’s taste.